On today’s episode of Living With Money, Tim talks with Kris Venne. Kris is the Director of Wealth Management at Ritholtz Wealth Management based out of NYC. 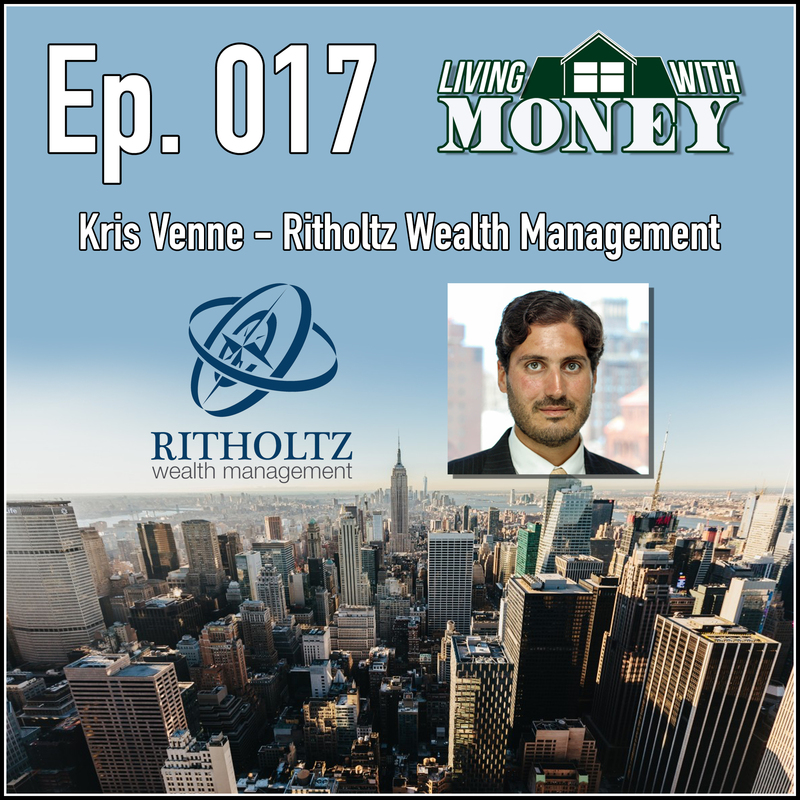 Ritholtz Wealth Management is one of the fastest growing RIA’s in the nation, and Kris discusses some of their philosophies within the firm that help them standout from the rest. They talk about on-boarding new clients, setting client expectations, and Kris’ unique take on what is “next” to come for advisors. It’s not what you would expect! Enjoy Ep. 017, our talk with Kris Venne! Tim Mullooly: Welcome back to Living with Money. This is Tim Mullooly. On today’s episode, I’m joined by Kris Venne. Kris is the director of wealth management at Ritholtz Wealth Management in New York City. Kris is also a CFP. If you’ve seen any of the stuff that we put out at Mullooly Asset Management, we love all the work that they do at Ritholtz, so I’m very happy to have Kris here with us today. Kris, thanks for coming on the podcast. Kris Venne: Hey, thanks for having me, Tim. I’m glad to do it, man. Tim Mullooly: In the finance industry, Ritholtz Wealth Management is pretty well known to people within the industry, but for any listeners out there who might not be familiar with yourself or Ritholtz, could you give them a brief background about yourself and how you got to where you are today? Kris Venne: Sure. I’ve been in the industry since late ’07 where I had been hired to be a financial advisor by the firm Wachovia Securities, which no longer exists. It was the tail end of AG Edwards and soon to be the start of Wells Fargo Advisors. So I joined a team of pretty well established advisors. The senior partner, his career started back in the late 1970’s. And just prior to the financial crisis, I suppose they decided it was time to bring on a junior, and I had been looking to break into the industry, so it worked out really nicely that we had a mutual connection and we all hit it off. And wouldn’t you know, within a few months of hiring me, the financial crisis happened. I don’t know if that’s directly related to me joining the industry or what, but it sure seemed like it. I was fortunate to, unlike a lot of the people who I started with, I mean I think there were 70 people in my training class. Half a dozen maybe remained within a few years. It was a wash out. I was really fortunate to have joined a team that was pretty well established and had a good folk of clients and a steady stream of revenue, and people who had really seen a little bit of everything. That sort of mentor, mentee relationship, that was great. The problem was I didn’t really find a fit in the brokerage world. That said, I did spend a few years there, and I took advantage of every minute of it. I earned my CFP and went through every available training program that the firm offered. I think the suspicion had begun to creep in early on that a fee-only RIA world was really where I wanted to be. I think that thought process was helped along by the stuff that Josh Brown and Barry Ritholtz, who were now my partners, by the stuff that they were writing and putting out there in the world. So, I’d be in a meeting with a group of brokers. I mean, every week they quite literally had sales meetings where they would invite mutual client and annuity wholesalers in to come and teach people sales ideas to go out and take the available cash in their clients’ accounts and flip them into commission products. So, I’d be in, in the morning, sitting through one of these, and in the afternoon, reading a blog post that Josh was writing on The Reformed Broker confirming my suspicion that, wait a minute, this is probably not the best way to get this stuff done. At the time, I was in a branch up in Syracuse, New York, where I had gone to college, and decided with my wife, hey we’ll just stick around. Great area, low cost of living, a lot easier to get started than down here in New York, where we were from. I think at that point, this is in 2011, we were pretty set on wanting to head back to the New York area. Our kids were growing up, and we wanted to be down by the beach where we loved to be where we grew up. The original plan was to go to another branch at Wells. It didn’t turn out that way because I ran into Josh and Barry through happenstance, and we really hit it off. This is at a point when they had only been together at another firm here in the city for a short period of time, and I think that they pretty quickly realized that they wanted to add a planner to their group, and I was CFP, and it just kind of worked out. The best way I can put it is it was like being able to join the band that you’d been following. At that point, it was just Mike Batnick, Josh Brown, Barry Ritholtz, and an admin that we had at the time. We were growing quickly and had big dreams. This is January of 2013 when we started together. By September of 2013, it was time. We launched Ritholtz Wealth Management, and we did it with just about 100 million in AUM. And here we are, just before our fifth birthday, and we just passed 810 million in AUM. We’ve got offices all around the country. There’s 24 of us. In 2016, we were recognized by FA Magazine as the fourth fastest growing firm in the country. And frankly, those kind of accolades are great, but that’s really obviously not why we do this. But just as a demonstration that in a couple short years, we’ve really put something, I think, spectacular together, and we’re continuing to head in the right direction. Tim Mullooly: Well that’s great, and I agree that you are putting something pretty spectacular together. We’ve been following the growth of Ritholtz for a couple years here at Mullooly Asset Management, and it’s been pretty great to see all the things that you guys are doing. Getting back to when you guys started in the business, it was 2008, the crisis happened. Working on the other side of the business, as opposed to the RIA that you are now, what would you say was the best thing that you took from working on the wire house side that prepared you for success over with Ritholtz? Kris Venne: I think there’s something to be said, and this is true in any area of life, that sure, it’s great to be excited about the right way to do stuff, but without context, it’s really difficult to understand why it’s the right way. So, please don’t misinterpret me. There are great people in the brokerage world. This is something I tell potential clients of our firm all the time. This is something I tell other industry people. It’s a really fine line to indict the system and the compensation structure and the incentive structure. It’s a whole other thing to talk about the individuals. Now, there are some people that will cut me off and say, “Oh no. There’s plenty of bad people.” Sure, there’s plenty of bad people in the RIA industry also. This is, I think, a simple incentive structure issue. When you incentivize people financially to do one thing that, look, I know plenty of great advisors on wire house side who are raising families, who are building lives for themselves, and if they’re looking at a decision about whether or not to sell A or B to a client, and A happens to pay them a little bit more, humans are humans. And they’re prone to bad decision making. That’s something we talk about a financial planning level all the time, that people are prone to behavioral issues. One of them is responding to incentives. With that caveat, I think having seen the way people operate in the brokerage model, right now here we are, hopefully exemplifying the exact opposite of that. Rather than leading with product, we’re leading with planning. At first, that was sort of revolutionary. That was not the norm, but I think it’s fair to say that at this point in 2018, that’s becoming common. That’s becoming the expected protocol. Having seen the way the other side of that works, I think that was really valuable. The other thing you’ve got to be careful about when you’re talking about the bigger firms is, and for better or for worse, they have big training budgets. They want to turn people into educated sales people because that’s ultimately what they’re going for. Along the way, there’s opportunities. I got my CFP underwritten by big firms. All that infrastructure, it doesn’t necessarily only spit out bad stuff. You’ve just got to be judicious about what you’re taking from it. Tim Mullooly: That’s really true. It’s almost more of a systematic issue than the individuals that are within the space. Kris Venne: Yeah. There’s a low barrier to entry, so sure. You get people in the brokerage world who aren’t ideal, but you get plenty of really great people. I know a ton of them, and I’m friends with a lot of them. I’m really careful not to malign them as individuals, but frankly, the incentive arrangement within these firms, it’s not in the clients’ interest. It’s in the shareholders’ interest. It’s that simple. Tim Mullooly: While you were transitioning from the Wells Fargo side over to joining Ritholtz, I read in a blog post, Josh said that you kind of put him and Barry in their place during your interview with them. What’d you say to them to put them in their place? How’d you work up the guts to say that during an interview? Kris Venne: I think it’s fair to say that the group of us had some instant chemistry. It definitely worked really well. Look, the idea to add a planner to the group at the time wasn’t to lead with planning. It was to add it as an ancillary service. Look, that made sense because this idea that the first thing you do, in the case of our firm, is we spend an enormous amount of time on the front end, which we still get questions about. Wow, you guys are investing a lot of your time to build this plan, to make sure that the client’s a fit, to going through presenting the plan and the investments. That’s a pretty hefty commitment prior to someone signing any paperwork. What I talked to them about right as we sat down at the interview is no, you have to do that because how on earth are you going to make a recommendation about how someone should invest their money if you don’t know as much as you could possibly know about their situation? That’s not to say that we’re producing the final version of a financial plan in the first couple meetings because there is no such thing as a final version of a financial plan. A financial plan is a decision making tool. It’s a behavior management tool. It’s an ongoing process that our clients are entering into. I think it’s fair to say I made that explicitly clear that that’s the only way to go about doing this. Tim Mullooly: Yeah, it’s kind of like if you’re a doctor trying to diagnose someone who comes in with symptoms and you’re not getting the entire picture. It’s hard to say what’s wrong with them. Kris Venne: Love that analogy. Tim Mullooly: A lot of people say any successful firm has obviously satisfied clients, but with a high retention rate as well. That’s pretty important to any advisory firm. How would you say that an advisory firm should go about doing that? Kris Venne: About increasing client retention? Tim Mullooly: Yeah. How would you say is one of the best ways to maximize client retention? Kris Venne: By building relationships. By building relationships in as many ways as you possibly can. By having advisors who are really good at communicating. When I just mentioned this heavy front loaded work that we do when we’re bringing on new clients, I like to say that the end of that process, it’s a multi-call process. At the conclusion of it, if the potential client at that point isn’t ready to become a client, then either the advisor did a terrible job somewhere along the way, or they’re just not the right fit for the firm. That front loaded work really continues on through the relationship, but if you think about a firm like ours, between The Reformed Broker, between Barry’s blog, between Ben’s blog, Mike’s bog, Tony’s blog, the podcasts, these people are not hurting for an idea of how we’re thinking about things. They’re not sitting around wondering, “Well what are the guys at Ritholtz think about situation X, Y, or Z that’s going on?” There’s no mystery there. Tim Mullooly: Yeah. There’s going to be guaranteed blog posts about pretty much any topic that they would want to know about. Kris Venne: Or a Tweet. You know, it’s all there. That’s not to say that every advisory firm out there should go out and have a bunch of blogs going and Tweet all day. That just happens to be what we’re doing. But having an engaged client base, it goes a long way. It really, really does. Kris Venne: Without context, it’s really hard for people to justify why they’re paying an advisor a fee. That’s a big failing in this industry. That’s true on both the brokerage side and on the RIA side. The effort you put into keeping in touch with your clients, it’s why you’re doing it. We’re here to help people manage behavior over long periods of time. You can’t manage those behaviors if you’re not talking to them. It doesn’t work. Tim Mullooly: Even just little touches of contact out there might seem insignificant at the time, but it seems like a big deal to the clients. Like, hey they’re still keeping in contact with me. They’re still engaged in my situation and want to know what’s going on with me. Tim Mullooly: In an interview that you did on Inside the WMCP, which is Wealth Management Certified Professional, you stress the importance of setting expectations for clients at the onset of the relationship. Can you talk a little bit about that and why you feel it’s so crucial? Kris Venne: Absolutely. Without expectations being set right from the get-go, these relationships we have with our clients, they could be really perceived as being very amorphous. If our job is to help to increase the predictability of someone’s financial future, you’re going to have to do what you can to increase the predictability of their relationship with you. There’s a number of, and for the advisors that are listening, there is a pile of great books that I think everyone should read. One of them is a book called the Supernova Advisor. I’m going to reach down to get the author’s name. It’s not on the top of my head. By Rob Knapp. The Supernova Advisor, and this is a phrase stolen directly for this book, they really do a good job, he does a good job of discussing how to communicate your value proposition. One of the terms that is a highlight of the book, that we use all the time, is 12-4-2. 12-4-2 is simply how we’re going to be in touch with you over the course of the year. What that implies is that there are 12 touches that come from us to our clients. That could be a phone call. That could be a sit down. That could be just a simple email exchange, but we’re going to reach out 12 times over the course of the year. The four is we’re going to do four full scale reviews of your plan. That could be maybe something that isn’t always relevant to happen on a quarterly basis, but we’re certainly going to reach out to make that offer. Two is we’re going to offer two planning sessions. Those two planning sessions could be what, we’ve reviewed a plan, but let’s dig into this thing and make sure it’s up and running and functioning the way it should, and that things haven’t changes in your life. Now, does that mean that with every single client, all those things are happening like clockwork? No, because you know what, if you were a client of ours, I’m not going to even, if we spoke about something off topic last week, I’m not going to certainly jump on the phone with you and like, “Oh hey, I know we were talking about this one thing, but let’s go about this robotically.” That’s obvious. We want to make it really clear that we’d like to see all of our client relationships have these pre-scheduled contacts. This way the client is sitting there thinking to themselves, “Well alright. Kris is going to be in touch in the middle of May and we’re going to set up a call,” rather than that, like I said, that amorphous set of expectations where I don’t know, I guess when volatility picks up they’re going to call. That’s the last thing we want to do. We don’t want to be on the phone with someone just because volatility picked up, meanwhile we’ve spent the past couple years drilling in their heads that that stuff doesn’t necessarily matter as far as the outcome of their plan. A couple weeks ago when we had a few upticks in volatility, I know it’s hard to believe, but we didn’t get a single phone call. Kris Venne: Not one. We got an email from a retired trader, who just wanted to talk to us because of his professional background. It’s all about setting those expectations really early on about when and how you’re going to hear from us, and what, over the course of the year, to look forward to as far as the proactive part of our relationship. Tim Mullooly: Yeah. As you were saying that I was thinking, “The one thing that he isn’t mentioning is performance.” Which oftentimes when clients come in, that’s one of the first things that’s on their minds. How do you balance or weed out the people that are just interested in performance versus people that actually buy into the full financial plan aspect and realize that performance is just a little piece of that pie? Kris Venne: It’s a great question and you have to recognize that look at our media exposure. You’ve got Josh Brown on CNBC four days a week, so it’s natural to expect that there are going to be people coming to us looking for stock picking and all these things that frankly we don’t do or believe to be necessary when it comes to these bigger picture financial plans. The first conversation we’re having with a potential client, initial phone call, we call our fit meeting. The way the fit meeting works is simple. The prospect is going to tell us their story. Why now, what brought them here, what’s their experience, what’s their professional background. Really just ultimately to hear what’s driving them to the firm. The reason we call it our fit meeting, pretty simple. It’s implied in the name. We’re trying to figure out if a fit exists. We have a couple of concrete knock-out factors that we’re looking for. One of them, since you mentioned performance, is someone who’s looking for an unrealistic set of expectations as far as performance. Someone who’s hiring an advisor because the suspicion they have is that we’ve got a better handle on things than they do, and somehow we’re going to do better in the market. Tim Mullooly: Right. They want some of the secret sauce. Kris Venne: Barry’s sitting in a laboratory somewhere figuring things out. That’s not how it works. Early on in the development of the firm, we would maybe be a little more generous with those fit meetings, and let a few people get through who probably shouldn’t have, and it was to our detriment. If you’re running an advisory business, the cost and time associated with this heavy front loaded on-boarding process, it just doesn’t allow for it from a business perspective, but more important than that, we just want really great people. We want really great clients and we want really great people working here. If everyone’s happy, it’s a tremendous work environment. But when you have firms that physically wince when the phone rings because they took on clients they shouldn’t have, that’s a real problem. So if our value as behavioral investment counselors, that’s the value that we’re proposing the clients, how are you going to help manage someone’s behavior if you don’t get along with them? It’s just not going to happen. Tim Mullooly: You described Ritholtz Wealth Management as behavioral investment counselors. How would you describe what that is and what a behavioral investment counselor’s value proposition is to their clients? Kris Venne: Sure, great question. First off, behavioral investment counselor is a term coined by Nick Murray in his book, The Behavioral Investment Counselor. It’s simple. If we know that one of the top determinants of a successful investment plan is going to be the client’s behavior, the investor’s behavior, then our value has to be around managing that behavior. And I tell clients this all the time, removing your emotions from the equation, you’re probably going to be fine going to Vanguard and paying almost nothing, buying S&P 500, participating in the growth in the economy, and going about your business. But the reality is, that’s not going to happen. Tim Mullooly: Yeah, easier said than done. Kris Venne: Yeah, it’s simply not going to happen. Over a 30 year investment plan, the probability of that working out for someone is next to zero. When we’re thinking about all the stuff that we do here at Ritholtz Wealth Management for our clients, I like to think of every activity that we’re putting out there into the client relationship as a behavioral nudge. So, starting with figuring out if the client’s the right fit. Building them a financial plan to realign their expectations to make that benchmark a personal one. Building an ultra-diversified, globally diversified low cost portfolio. That’s another nudge. Acknowledging that sure, the S&P 500, it’ll get you there, but if we could figure out a way to build a truly diversified portfolio, diversified by asset class, we’re providing you with another nudge. We run our portfolio goal tender, our tactical portfolio that’s meant to be another behavioral nudge for periods of heightened volatility. We reduce our clients’ fees. We call it milestone rewards. After you’re with us for three years, we reduce your fees to help get you over that three year itch. That’s really common out there for investors who maybe want to go out and try something new, or their account didn’t go up enough or went down too … whatever it is. All of these elements coming together, that really makes up your job as an advisor here to be that behavioral investment counselor by utilizing all these different nudges to help keep your clients’ wits about them. To help keep your clients invested. That’s the hard part. Tim Mullooly: Emotions play such a big part in people’s decision making, and having someone there on their side to nudge them in the right direction and keep them in check when things get tough is one of the most valuable things, I think, that an advisor can offer. Kris Venne: It’s all that advisors are doing, or should be doing anyway. We’ve just institutionalized some of these things, and made this deliberate decision to treat all of these activities as specific nudges keeping people on the straight and narrow. Tim Mullooly: So that term came from Nick Murray’s book. I know I’m a big fan of Nick Murray as well. Is there something in particular about Nick Murray’s writing and his work that you like? Kris Venne: The thing I like about Nick Murray is the thing a lot of people hate about him, and that’s that he just tells it like it is. The Ask Nick section in his monthly newsletter is just, you could go back for years and the man just stays on message. The Ask Nick section is great because it’ll be an advisor writing in, “Hey,” insert some variation of I’m willing to compromise the things I believe to get or keep a client. Nick’s almost consistent every time immediate response is, “I think it’s best that you immediately resign from the industry and move onto something else,” which might be a bit harsh, but that message that, look we’re here to do some very simple things over long periods of time for people. There are plenty of clients out there. If the client is unwilling to take your advice, if the client is not finding value in the work that you’re doing, either it’s not the right client or you’re doing a terrible job as an advisor. To answer your question, that sort of dedication to the value of our craft is what I like about him. Anyone who hasn’t, should go out and grab The Behavioral Investment Counselor. Also, I mean he’s written a number of books, but the other one that I think is a must read is The Excellent Investment Advisor, which I think is out of print, but you can definitely grab on Amazon. Tim Mullooly: This business isn’t terribly complicated. There are a lot of simple things that need to be done. Some advisors who might be out on their own running their own business are also a business owner, so it’s hard for them, or they struggle asking these questions. Maybe I can compromise to fit a client in if it means more business for me, but in reality, it’s going to cause them more headaches, like you were alluding to before. You’d rather work with great people who are a good fit for your business because in the long run, yeah you might have to turn a couple dollars away, but you’re going to be happier in your work environment. Kris Venne: And it’ll come back to you in spades, man. The bottom line is if you want to grow your business and you already have some clients you’re working with, you want to replicate the ones you like most. The ones you like most hang out with people who aren’t dissimilar from themselves. And the only way they’re going to be able to sit down and tell their friends and family that you should go and work with my advisor is if they’re able to effectively tell them why, effectively communicate to them, you should work with my advisor because. And if your advisor is trying to be all things to all people, you’re probably going to have a hard time referring them. In fact, you’re probably not going to stay with them. Yeah, it’s just absolutely, just to answer your question about Nick Murray, that sort of dedication that he reminds us how important it is, that’s what makes him so great. Tim Mullooly: Totally agree. We’ll link to those Nick Murray books in the show notes when this episode comes out for anyone who hasn’t read Nick’s books. Definitely check them out. Kris Venne: His interview with Barry wasn’t bad either, so on Masters In Business. I would give that a look. Tim Mullooly: Yeah, we’ll link to that as well, so you guys can listen to that. For new advisors at Ritholtz Wealth Management, what’s the most important thing that you try and impart on them when they’re getting started with the firm? Kris Venne: I think we’re a bit unusual, so I don’t know that this is going to apply to everybody listening, in that we have a fair amount of people reaching out to us proactively on a, sometimes daily, basis. What that does is it flips the typical incentive structure on its head. Whereas you get hired by a firm, whether that’s an RIA or a brokerage firm, the expectation placed on those new advisors is you’re going to figure out a way to go out and find clients. And for firms like Ritholtz Wealth Management, where we have a big media footprint and lots of visibility, it’s a totally different approach. For us, I mean over the past couple of months, we’ve added a fair amount of advisors. The most repeated conversation I’m having is you’ll have someone who will jump on the phone with a potential client. They’ll begin taking them through the process, and sometimes the potential client gets antsy and says, “Oh, you know what, this sounds good. We don’t have to finish all the calls. We don’t have to wrap all this stuff up. I’m in. When can I open my account?” For a lot of advisors who have not yet had that experience, it’s really tempting. We get one of the new advisors, and this has now happened a couple times. The most recent one, I’m not going to name any names, but I think he was a little peeved at first when I said, “You’re saying no to that person. That’s it.” They’re not a fit. It’s not going to work. Either you convince them to tap the brakes, or just part as friends, and it was a pretty big account. It was a couple million bucks. It was a good relationship theoretically. That was a big departure for that person to hear their, the person in my role, telling them no. I’m going to tell you that person now having been here a little bit longer and gone through the process a couple times, laughs about it. He says that as tempting as that was, he’s like, “I am so glad that I didn’t do that,” because now having gone through the process a dozen times since then, you recognize that wow that is a person, that potential client, was someone who just didn’t get it. And he was brand new. It was no fault of his. It’s something you learn by experience. Listen, the clients who have started from their initial call with us and gone through this elongated deliberate process to becoming clients, the ones who follow that 12-4-2 protocol, the ones who are reading all of our stuff, I’d like to think these are clients for life. Whereas if you fast track someone, if you took someone on who just because they were ready to go, and they were pumped up about signing paperwork, my guess is once that person would have been here for a little while, they maybe this wouldn’t have been for them. Maybe all that on-boarding time would have been for nothing. Tim Mullooly: Right. Yeah. You’re renting their fees, in a sense, as opposed to getting a lifelong client. Kris Venne: You got it. Tim Mullooly: Processes, like you’re saying, are there for a reason. Once you go through them and you actually see that they work, it makes it easier to resist that temptation. Kris Venne: Josh likes to say, “Standardize the process, personalize the advice.” And it’s true. That’s, I think, the most important message that we can be giving to our new advisors. There’s a process. It works. Stick to it. Everyone’s going to have their own unique circumstances. Build the plan accordingly. Tim Mullooly: Yep. Going back to when you got started in the industry. Things in the investment advice, financial planning world are changing every single day. We see robo-advisors and just a shift towards fee only advice, as opposed to the traditional broker aspect. Where do you see the industry going in the next five to seven years? Kris Venne: Sure. We pay careful attention to the robo-advisor stuff. In fact, we have them. We have Liftoff. Liftoff was created out of necessity. We had a lot of really great people coming to us early on, younger investors. Perhaps people who didn’t really have much in terms of investible assets yet, and our first gut reaction was, listen go on, try Vanguard. Go to Vanguard, pay very little to get a globally diversified portfolio and stay in touch, read our stuff, and when the necessity is there to build a more detailed plan, we’ll be waiting for you. That’s really the advent of our investment minimum, which I think in most cases, firms use investment minimums just for revenue purposes. For us it was if we’re here to help manage people’s behavior, and someone’s got a smaller investment portfolio, look a 1% or 2% move in the stock market’s really not going to do too much to their psyche. Whereas, you got a million, two million, three million bucks, and all of a sudden that 1% or 2% move in the markets, that becomes really uncomfortable without question. So, sure there’s a place for robo-advisors, but I think there comes a point when they’re not going to be as helpful at any point. There’s something that cannot be replaced there, and that’s a close relationship with a trusted advisor. When I talk about what’s to come and what I think the next couple of years hold, look you have a huge, huge … I’ve had more people pull the trigger on retirement over the past couple months than I have collectively in the entire 10 years I’ve been doing this. And you can attribute that to market growth. You can attribute that to demographics and a whole host of other things, but whatever it is, it’s happening. It’s happening fast. I think one of the biggest responsibilities advisors are going to have over the next five to 10 years, and this is how I answer the question, what’s to come. What are the next things? And a lot of people are quick to answer more technology and more apps, and this and that. Sure, but that goes without saying. That’s an easy answer. What’s really to come is you have a generation of people who are going to have a whole lot of difficult spending money. You have people who have, a generation whose parents grew up in the depression, who saved and invested and saved and invested for the first six or seven innings of their life, and all of a sudden here they are. The expectation is well, now that I’ve saved and accumulated all this money, now I’ve got to spend it. There’s a lot of talk about people spending too much or people running out of money, and sure, that, without question, is a problem for a portion of the population, but the other portion, the portion that’s coming to wealth management firms looking for advice, I could give you dozens of examples of families who were maybe unaware of their own mortality. Kris Venne: Where I’m spending a lot of my time in client conversations right now is I think where a lot of this industry’s going to have to start spending their time over the next five to 10 years, and that’s helping people feel comfortable with this idea that, you did it. You saved and invested money. Now you have a whole lot of it. We’ve got to come up with a plan for, forget generational wealth transfer, and estate planning. Just making sure you’re living your life. Making sure that you’re doing these things that you want to do. And advisors are so conditioned to think, well what’s your goals. Well, the time is now where some of these goals are being executed on. And I find that in a lot of our conversations, and perhaps we’re a bit skewed because people are coming to us because they read financial blogs for a hobby, so maybe that makes them naturally a little bit more frugal or skeptical. But either way, I suspect that this is going to be a problem across the country. When people ask, “What’s next?” I think that’s next. Helping people get over that hurdle and finding some comfort in writing those checks and doing the things they want to do. Tim Mullooly: That’s a pretty unique answer. I wasn’t expecting that because like you said, a lot of people in the industry, you just hear often about save, save, save, bring money in. It’s counterintuitive to think that you have to teach people how to spend money. When you explain it like that, it makes sense. People growing up in the depression, who’ve been saving their entire lives, it’s in their DNA to not want to spend money. Kris Venne: Yeah, their parents primarily grew up in the depression and imparted this stuff on them. You have this reluctance to switch from accumulation to distribution. You could build a plan all day long and show people what they could spend. You could show them academic writings on, well if you withdraw this percent or that, it’s not what’s getting it done. What’s getting it done is building that trusted relationship, having someone there, and really put all of it into context. I think that challenge is first of all, it’s a challenge. It doesn’t mean it’s going to work for everyone. I think there are going to be plenty of clients of wealth management firms who never get over that hurdle because they spent 35 years doing the opposite. We don’t change. People, once they are who they are, it’s really difficult to switch mindsets on things. When it comes to your security, which that’s what assets represent for most people, it’s tricky. Tim Mullooly: Technology’s going to come, and that’s obviously a given. People are going to adapt to that. So, I feel like it’d be easier to adapt to technology and how that’s going to change. What you’re talking about there might be much more difficult to unwind some people from their initial trains of thought. Kris Venne: Yeah, there’s going to be AI and apps, and this and that, but at the end of the day, you take someone who’s in their mid to late 60’s, and they’ve accumulated funds and they have kids and grandkids. They’ve had a successful career. They’ve managed to, through their hard work, accumulate all these funds. Turning that into a, I don’t even want to say a stream of income, but just turning it into something that you’re going to tap into to use to lead the remaining years of your life, that’s going to be significantly aided by having a good advisor on your side. Tim Mullooly: Absolutely. Kind of along the same lines of making sure that you’re living your life, you hear a lot about having an important work-life balance. What are some things for you outside of work that you’re passionate about that help you bring some balance to your life when you’re not working? Kris Venne: I think at this stage, that’s going to be all family, man. I coach my son’s lacrosse team. I jumped off the Long Island Railroad yesterday and go and coach fifth graders on how to run around with sticks and throw balls at each other. My daughter is actually graduating from Syracuse University next weekend. Kris Venne: Thank you, man. I think she’s got it figured out. She’s on her way to Columbia University for grad school, so for now, I think she’s going to do all right. But in the meantime, it’s my son who is a fifth grader, who, he’s the focus of the remaining energy I have. Tim Mullooly: After Columbia, is another Venne coming to Ritholtz Wealth Management? Or going a different route? Kris Venne: Well she’s actually, she’s going to school for social work, specifically gerontology. It’s funny you ask that because I’d love that. I think there’s a huge need in the wealth management industry for people who are prepared professionally, and frankly personally, to deal with the issues that come along with aging. Everyone feels these things differently, but what I’ve been talking to a lot of the advisors in the firm about is lifespan. Most financial planning tools will default to whatever the actuarial tables say. I’m pushing everyone up to 100 because not only do I think that the population is going to continue to break records for lifespans, but I think that the life within those lifespans is going to continue. What I mean by that is a have a 97 year old grandmother. She’s not doing much. She’s watching TV, watching golf, but I think that’s not really going to be the case with a lot of the boomers. The idea that there’s that many more years to live the life that we’re pushing them to live sort of implies that after that, it’s going to be an interesting challenge for our society that to deal with that many people who have hit 90 and 100 or whatever else is to follow. Yeah, I think that maybe they’ll be a gerontology department at Ritholtz Wealth Management in a few years. Who knows. Tim Mullooly: Well Kris that actually is going to wrap up this episode. I want to thank you again for coming on the podcast. It was a pleasure talking to you. Kris Venne: Glad to do it, Tim. Thanks a lot, and good luck with this. Tim Mullooly: Thank you. We’re going to link to Ritholtz Wealth, and all their blogs everywhere. You can find them all over the internet. Some of the books that were mentioned as well. We’ll link to all that in the show notes, so be sure to check that out. If you’re listening to this on iTunes, please subscribe to the podcast to get new episodes every week, and feel free to leave us a review or a comment, because it would really mean a lot to us. Be sure to follow us on Twitter and Instagram at @LWM_podcast for more news and updates about the show.